The Prime Minister of St. Maarten the Honorable Sarah Wescot-Williams will travel to Aruba at the request of Aruba Vice-Prime Minister Mike De Meza to show support to Aruban Prime Minister Mike Eman who is on the fourth day of a Hunger Strike. The Prime Minister also met with the Chuchubi Aruba Foundation Board on Monday evening to update them on the situation as it develops. The Chuchubi Foundation represents Arubans living in St. Maarten. On Friday Aruba Prime Minister Mike Eman started an immediate hunger strike following a decision of the Kingdom Council of Ministers to have the Governor Fredis Rufenjol carry out an independent investigation of the 2014 budget and the tenability of Aruba’s government finances. Prime Minister Wescot-Williams on Monday stated that the precedent for the Government of the Netherlands meddling in the affairs of Countries in the Netherlands was set in 2013 when the Governor of St. Maarten was instructed to carry out an integrity assessment; “This precedent was created when the Kingdom Government instructed the Governor to do the Kingdom Government and that is what we have been seeing at this time. I warned all stakeholders that this was going to happen and they are using the same approach in Aruba. All of our requests were overruled at that time and the Kingdom Government refused and they are doing the same thing on Aruba. We cannot have outside influences from the Kingdom Council of Ministers interfere in the autonomous affairs of a country. There was an understanding that they would investigate the budget; there was an agreement to an investigation but not that the Governor would have been instructed not to sign it,” stated Prime Minister Wescot-Williams. The Prime Minister has also sent a letter to the Minister Plenipotentiary of St. Maarten the Honorable Mathias Voges expressing St. Maarten’s solidarity with the Government and People of Aruba. 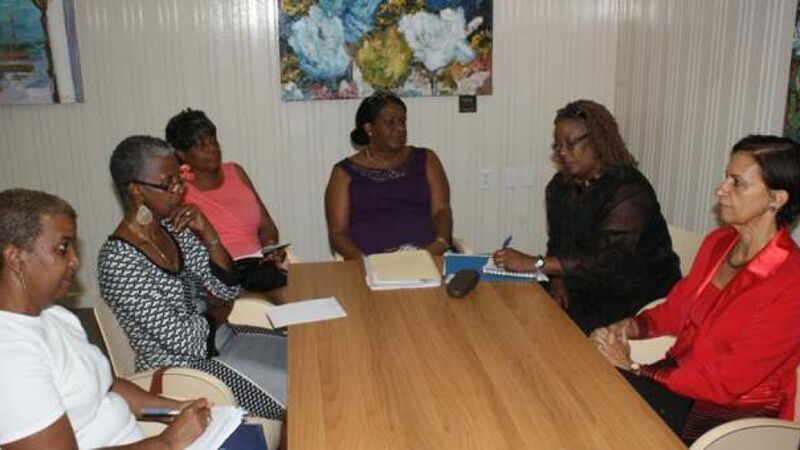 The Prime Minister updated the Board of the Chuchubi Foundation on the developments and what the stance is of St. Maarten; “The Vice Prime Minister of Aruba Mike De Meza indicated that PM Eman’s situation is speedily going down hill. The Government of St. Maarten has expressed solidarity with Aruba to the Kingdom Government, stating that it does not support the meddling in the affairs of a country. I was asked if I would travel to Aruba to show my support and indeed I will be traveling to Aruba on Tuesday. I am not sure what the expectations are but I think it is key to show solidarity and that is what will be happening. I think that it is important that I show solidarity and that it would be prudent to keep Arubans living on St. Maarten up to date on what is occurring there. There are indications by the Minister that both the PM and the Kingdom Government will not budge so I am very very concerned. In our letter to the Kingdom Government on behalf of St. Maarten we have expressed our solidarity and have asked that discussions happen to resolve this issue as fast as possible before there is irreversible damage to the health of the Prime Minister. It is very much for the political consumption of the Netherlands that they have made this decision in order to pacify their Parliament, much the same way as what happened with St. Maarten when the Integrity Assessments were carried out. The intention is also that I meet with Minister Eman and discuss with him. The Chuchubi Foundation expressed strength to the people of Aruba and hoped for a speedy resolution to the issue and thanks to the Prime Minister for taking the opportunity to keeping them abreast of the situation and for traveling to Aruba to show support. The Prime Minister has said that she would express the hope of the Chuchubi foundation to Prime Minister Eman and the people of Aruba for a resolution to the situation. There was also the suggestion that a church service be organized to pray for Prime Minister Eman and for a speedy resolution to the situation. The Prime Minister will be travelling on Tuesday and will return back to St. Maarten on Thursday.